EXCELEBRATION (IRE) (Bay 2008-Stud Ire. 2013, Aust. 2013). Champion Older Male Miler in France & GB in 2012. 8 wins-2 at 2-from 1200m to 1600m, Ascot Queen Elizabeth II S., Gr.1, Prix du Moulin de Longchamp, Gr.1, Deauville Prix Jacques Le Marois, Gr.1, Newbury Hungerford S., Gr.2, 2d Royal Ascot Queen Anne S., Gr.1. Half-brother to SW Mull of Killough (Newmarket Darley S., Gr.3). 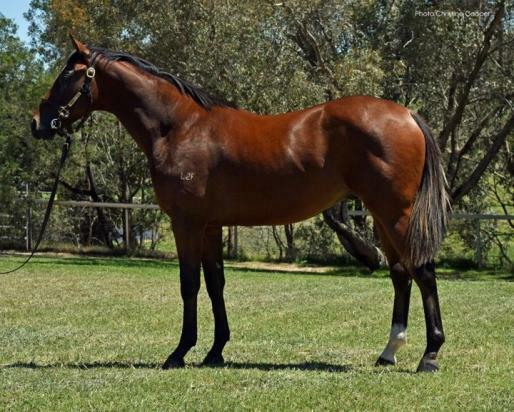 His oldest Aust.-bred progeny are yearlings. Lauren's Magic (f. by Beneteau). Placed at 3 in 2015-16 in Aust. Roczinta (Rock of Gibraltar). Winner at 2, 3d Kenilworth Winter Juvenile S., L.
Danazeeva. 4 wins from 1600m to 2200m, SAJC PMP Print H., 3d AJC Collingwood Hotel H., VRC Rising Fast H., QTC Intrepid Clipper H., STC Membership H.
GALIZANI (Galileo). 4 wins from 1400m to 2400m, A$195,725, ATC Epona S., L, City Tattersall's Club Cup, L, 2d ATC Japan Racing Association P., L, 3d MRC Catanach's Jewellers Ladies' Day P., 4th ATC Millie Fox S., Gr.3, Aspiration H., L.
DANARANI (Danehill). 4 wins. See above. Modesty on Ice (Overskate). Winner at 1m in GB, 2d VRC Honda Legend S., L. Producer. Imco Champ. 10 wins from 1400m to 2000m, Rome Premio Dagherotipia, Premio Ciacolesco, Premio Baly Rockette, Premio Fils d'Eve, Premio Duke of Marmalade, Premio Leicester, Premio Doncaster, Premio Zabarella, Premio Garrido, Premio Bruni, Premio Magabit. Zenarta (Orpen). 4 wins-1 at 2-from 1200m to 1800m, A$202,000, AJC V Group H., City Tatt's RC Equal H., 2d SAJC Australasian Oaks, Gr.1, 3d VRC Wakeful S., Gr.2, BTC Doomben Roses S., Gr.3, AJC Carbine Club S., L. Producer. DANZATORE (Northern Dancer). Head of The 1982 Irish 2YO Free H. 4 wins-3 at 2-from 7f to 9f, Curragh Beresford S., Gr.2, Ashford Castle S., Gr.3, Leopardstown The Minstrel S., L. Sire. VAGUELY MODEST (Vaguely Noble). 4 wins. See above. London Bells (Nijinsky). 4 wins-1 at 2-from 6f to 9f, 2d Royal Ascot Coventry S., Gr.2, Finger Lakes Rochester Cup S., L. Sire. ZAZOU (Shamardal). Champion 3YO in Germany in 2010. Champion Older Male in Germany & Italy 2011 (Intermediate). Champion Older Male in Germany in 2012 (Intermediate). 9 wins-2 at 2-from 1300m to 2200m, €630,595, S$150,000, HK$2,000,000, 132,500Kc, 46,000L., 1,101,000Dhs, to 2015 in France, Italy, Germany and Czech, Rome Premio Roma, Gr.1, Cologne Oppenheim Union Rennen, Gr.2, Baden-Baden Preis der Sparkassen Finanzgruppe, Gr.3, Düsseldorf Grosser Preis der Landeshauptstadt Düsseldorf, Gr.3, Krefeld Dr Busch Memorial, Gr.3, 2d Hamburg Deutsches Derby, Gr.1, Istanbul Anatolia Trophy, L, 3d Criterium de Saint-Cloud, Gr.1, Cathay Pacific Hong Kong Cup, Gr.1, Cologne Rheinland Pokal, Gr.1, Munich Grosser Dallmayr Preis, Gr.1, Baden-Baden Preis der Sparkassen Finanzgruppe, Gr.3.